Boarding at Calabash Kennels and Cattery is a real pet holiday experience! Exploring sensory gardens and magnificent odours, playing scent games and sprinkler pool games, taking nature walks and sweet, sweet naps! 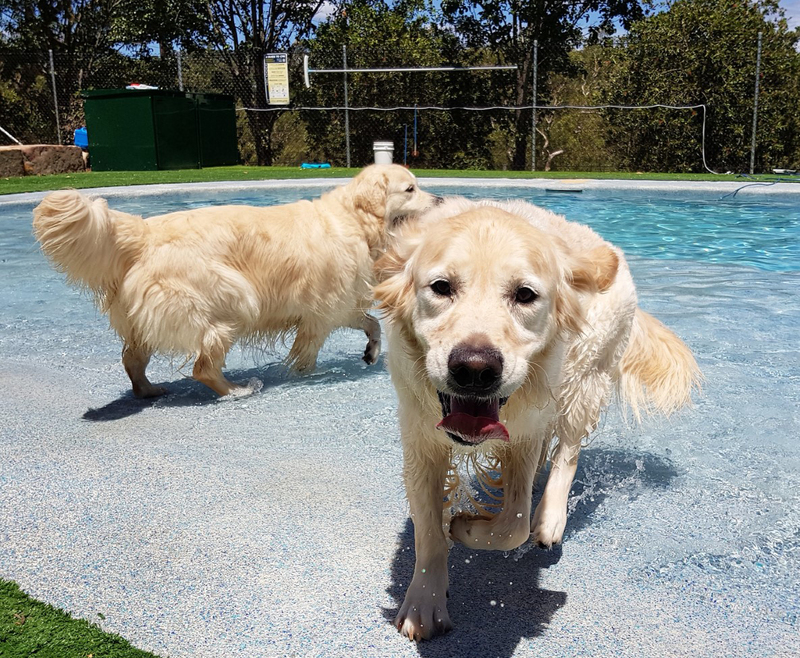 There’s not much better for fun-loving dogs than sharing these experiences with four-legged friends at Calabash Kennels and Cattery, Sydney’s premier luxury canine (and feline) boarding facility nestled in the rolling hills and natural splendour of Arcadia. 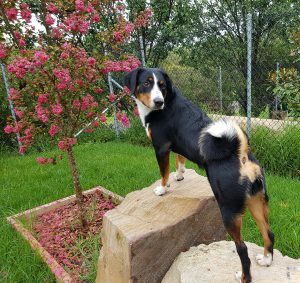 Calabash also offers a unique canine sensory garden filled with pet-friendly plants, calming herbs, blankets smelling of cats and horses, and containers of sensory delights – horse manure, alpaca fleece and more! When creating the garden, Linda focused on incorporating different textures (with woodchips, pavers and stones), ground levels and of course, shade. 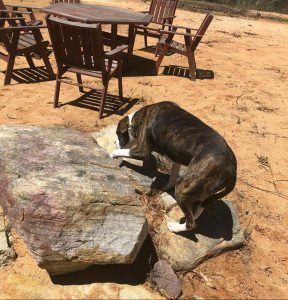 She created various sight barriers with big stones and tunnels that allowed dogs to play in one area safely by encouraging them to do more than just look at each other in a flat yard. 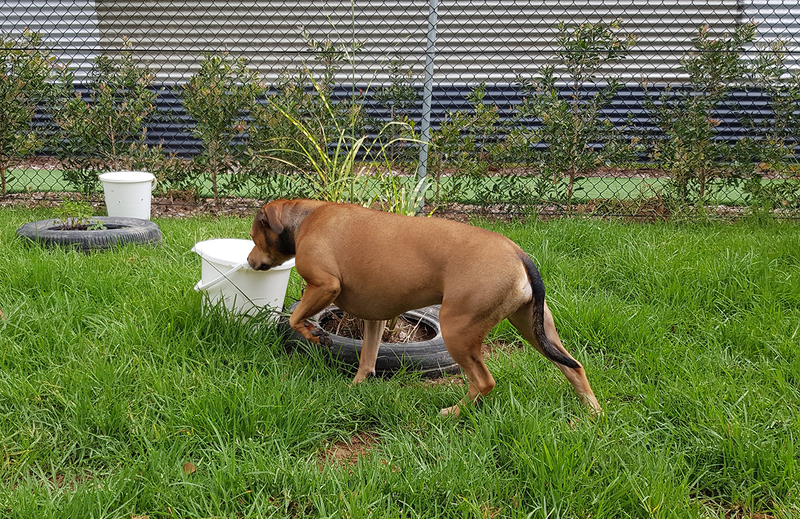 When it comes to encouraging dogs to sniff and not dig, Linda uses tyres to keep the plants in and the dogs out! The gardens also have sandpits to direct dogs’ digging energy into. Sniffing is calming for pets so what better way to relax them than to create a sensory garden? The garden salad bar has many herbs and plants from parsley, mint, lavender, basil and rosemary to chamomile, feverfew, zebra grass, lemon balm, pineapple sage and more. 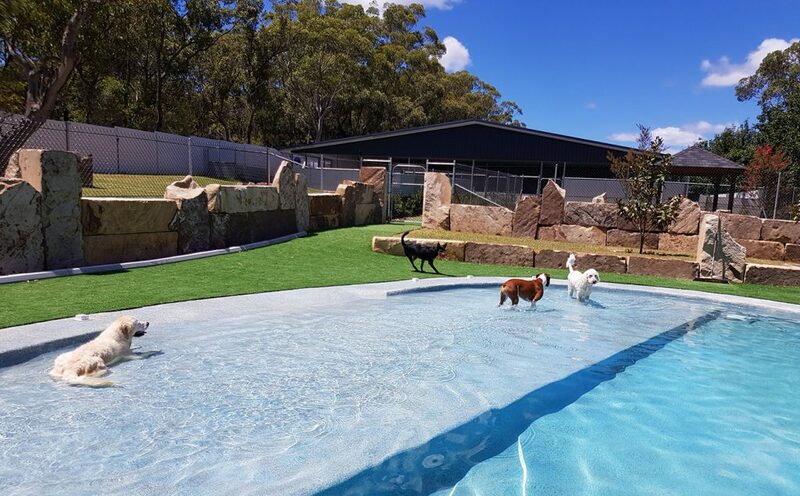 The canine guests also love a plunge in the pool (with a fabulous sprinkler system) and chase their new doggy friends through tunnels and over natural obstacles made of logs and rocks. Calabash also offers adventure walks on 25 acres of land, scent work games and behaviour training. 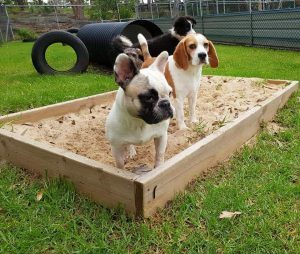 “I love being able to provide our furry boarders with an environment that will enable them to be safe, happy and enjoy their time away from home, so they want to return to us,” said Linda. Linda’s mission is not just to make pets happy during their stay, but to also lift standards in the pet boarding industry by redefining luxury and quality care. Offering a tranquil, rural retreat atmosphere and enticing smells, it’s no surprise Calabash has got a continuous high level of canine occupancy. Golden Retrievers Kelsey and Kobi, aged 14 and 13, have been going to Calabash about twice a year for the past 12 years – both never look back to say goodbye to their owners Robert and Jenny Johnson as they walk down to the kennels with their tails wagging. Kobi likes to dig and roll in the mud, whilst Kelsey prefers to walk and enjoy the aroma of the countryside, and get lots of cuddles from the staff, said Jenny. Sadly, the Johnsons had a bad experience with another boarding kennel when Kelsey ended up with a broken jaw. Calabash gave them all the confidence to board again. “They always come back from Calabash Kennels happy and healthy, and very tired so we know they had a good time. Kelsey and Kobi are more relaxed now especially when we go away,” said Jenny. Linda said many pets are shy when they arrive to the kennels and by allowing them time to work things out and not overwhelm them, they generally gain in confidence very quickly. “As I say to clients ‘dogs don’t google’ therefore they are only able to work out what happens in boarding by experience,” said Linda. “For worried dogs and owners, Calabash offers Day Care for dogs to get used to a kennel environment in a positive way. Linda said that Calabash staff carefully monitor the playgroups so all the dogs enjoy the experience. “If we have to keep a group to only two until the dog is comfortable, then that is what we do. We don’t allow dogs to stay in a group if they are worried; we find a different one for them,” she said. And when owners want to check on their dog while they are away, they don’t have to wonder what’s happening. All the furry guests at Calabash make regular Facebook appearances and Instagram to let their pawrents know what they’ve been up to, and they certainly have got a lot to share! Jack the Spoodle gets excited even before he arrives at Calabash! “My husband says ‘we are going to Calabash’ and the tail starts wagging and he runs to the door. Makes me think that home is not so much fun,” said Carmel. The Retreat compliments The Canine Lodge, which has indoor and outdoor areas built for making small to medium dogs comfortable in any type of weather. Both buildings feature exclusive rooms with their own outdoor areas, underfloor heating, air conditioning and room service with delicious, quality meals. “With the improvements over the years at Calabash, I am much happier leaving Ziggy there than in a standard kennel,” said Ziggy the toy poodle puppy’s owner, Rosemary Szwarcberg. Before Rosemary got Ziggy, she had a rescue toy poodle named Picollo who suffered from separation anxiety due to mistreatment. Picollo stayed at Calabash several times a year for 10 years until he passed away last year. He was a people loving dog who enjoyed the interaction with the staff and staying at The Lodge, she said. 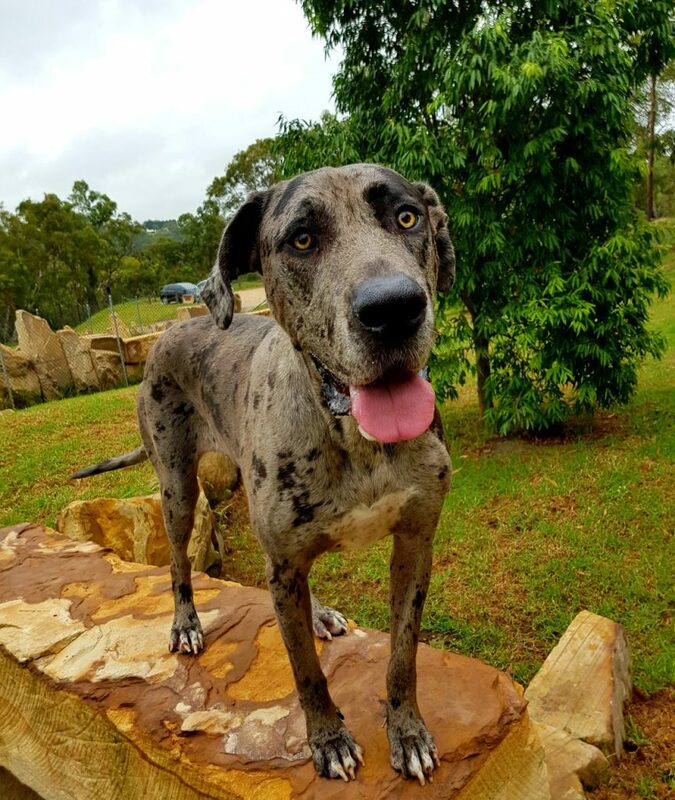 Calabash Kennels & Cattery is located in Arcadia, NSW and is owned and managed by Linda Meumann and Bob Hickman. Calabash Kennels & Cattery was first opened in 1989 and purchased by the current owners in 1997, renaming it Calabash Kennels. Calabash Cattery was launched in 2004, the Canine Lodge in 2016 and the Retreat in 2018. Calabash Kennels & Cattery’s philosophy is ‘Your pet should leave here in as good a condition, or better, than when your pet arrived’.